We will be open for blackberry picking on Wednesday the 22nd, Thursday the 23rd and Saturday the 25th from 9 to 5. We will have freshly made Amish-style fry pies for sale, grab a couple before they're gone :) . Be sure to bring home one of our sunny late summer bouquets (mini or large) when you visit the farm too! We are a u-pick farm dedicated to bringing you the highest quality, most delicious blueberries and blackberries imaginable. Come out and visit us, and have a fun day in the country as you pick our luscious sun ripened berries at the peak of flavor. Then stop in our country store for yummy snacks, cold beverages and tasty ice cream treats. 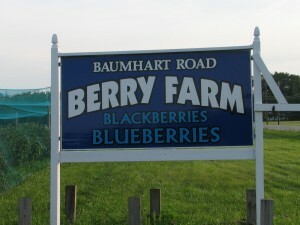 Come by yourself, or bring the whole family; a trip to Baumhart Berry Farm is a wonderful way to spend a sunny summer day. We love to hear from our customers. Please feel free to call us for directions to our farm, or if you have any questions. We do advise that you call before planning a u-pick visit. Although we strive to maintain our regularly scheduled days, we periodically need to close due to weather conditions or for ripening. Current visiting information is available 24 hours a day at 440-984-0141.